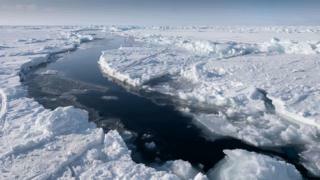 The US and Russia are among five countries to have signed a deal to prevent commercial fishing in the melting Arctic sea ice near the North Pole. Although the central Arctic is unlikely to have fish stocks for some time, scientists believe they will arrive as thinning ice melts in the summer. Several neighbouring nations have submitted claims to Arctic territory. A 21-member UN arbitration panel is considering the competing claims, with the focus on the Lomonosov Ridge, a 1,800km-long (1,120 miles) underwater mountain range that splits the Arctic in two. Denmark's claim is on behalf of Greenland, an autonomous Danish territory. Earlier this year, Russian Deputy Prime Minister Dmitry Rogozin opened a Russian drifting base on an Arctic ice floe, in defiance of a Norwegian travel ban. A deal barring fishing was almost completed last year, but Russia's annexation of Ukraine's Crimea peninsula in March 2014 brought talks to a halt. US officials said that although commercial fishing in the region was not likely to take place in the near future, a "precautionary approach" was necessary. The five countries had agreed to allow fishing in the area "only once one or more international mechanisms are in place to manage any such fishing in accordance with recognised international standards", a US statement said. Norwegian Foreign Minister Boerge Brende said in a statement that it was important to persuade other states not part of the deal not to fish in central Arctic Ocean. Environmental group Greenpeace welcomed the agreement but complained it was not permanent, accusing most of the countries involved of being motivated by resource extraction as well as fishing, rather than protection.